Spring. A fresh, new time of year. Spring cleaning. New stars. Essentially a seasonal version of those Mondays I wrote about in Monday's post. So when BoConcept got in touch and asked if I'd be interested in doing a spring pieces featuring a few bits from them, I knew immediately that I wanted to revamp my office and get it all freshened up and ready for production. The central piece is, of course, the desk. That's where the magic happens after all. This one is white but with accents of grey through it, and we all know a totally white room is bare and bland - so I'm going for a mainly white room with accents of grey, along with silver and gold. Metallics like silver and gold are reflective and, again, like with mirrors, it makes the space seem bigger. Of course, if that's not enough storage for you there are some lovely shelving systems from BoConcept which can be wall mounted above the desk so they're in easy reach, they're not taking up floor space (again open, clear floor space = room seems bigger!) and, although I've featured them all int he grey colour they all come in a variety of colours - so even if you do prefer darker shades there are options for you. The first one is the longest, the second stands alone which I think is really cute and the last one is obviously the biggest but I think you could arrange the three together on the wall in a way that would really make a feature out of the mix and match system. If you're not comfortable doing the mix and match thing yourself BoConcept do actually offer a free interior design service so they can do all the hard, mix and match work for you and it doesn't cost you a penny. So now that my main desk and storage is in place it's time to put a few things on there - and you guys know that Kate Spade is my main go-to for, well, pretty much everything. But they are definitely a stand out for pretty stationery and homeware, so their desk accessories are the clear winner. 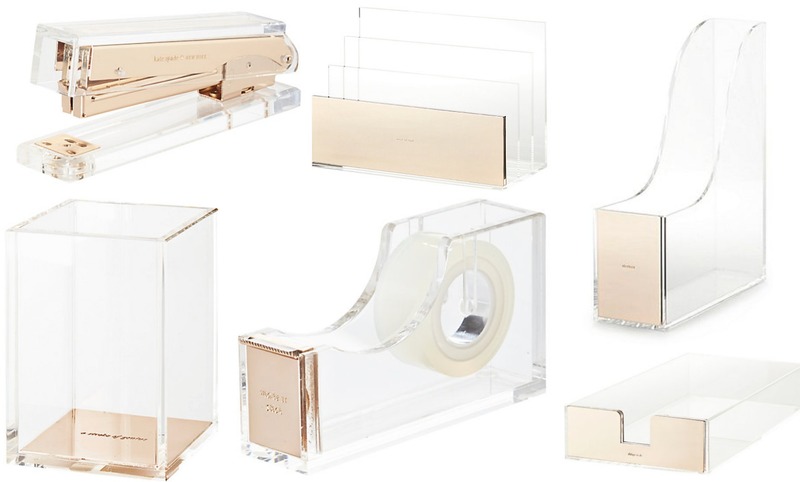 Everything about these would look so pretty on top of the desk - the perspex aspect combined with the beautiful gold accents is just too adorable and they're all practical - the pencil cup, the file, the magazine holder and the tray would keep everything neat and organised - and every desk needs a stapler and tape dispenser! Awards for the prettiest desk in all the land may be directed to me, thank you very much! The tackle box is amazing - it's got everything in it, clips and folders to keep bundles of paper together (very important for me! 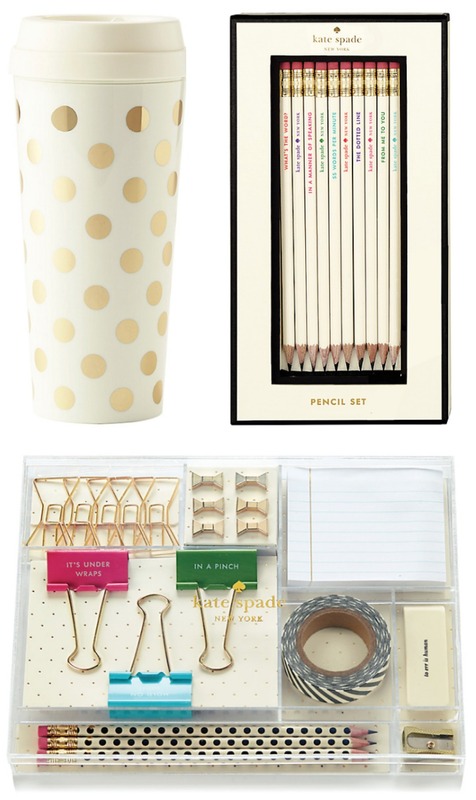 ), tape, a little notepad, those adorable bow pins and three super cute pencils. Unfortunately for me three pencils is nowhere near enough so I'd have these ones on my desk and then this little pencil box over by the sofa for when I want to leave the desk and read over what I've written in comfort. Anyway, let's talk about that sofa. Sofas are some of what BoConcept does best and this designer sofa really is just incredibly beautiful. This is the Monaco sofa, and it is the sofa of dreams. It's on legs so it's up off the floor which, again, say it with me now, creates an illusion of more space. The grey colour isn't too cool that the sofa is uninviting (in fact, it's maybe a little too inviting!) but it's still sleek and light and won't close up the space. The fact the little rest end is included means there's plenty of space to sprawl out and edit - or, if you're putting the sofa in another room, to sprawl out and watch TV. Although the BoConcept pieces are maybe a little more expensive than IKEA, they do all come with a lifetime guarantee. Like, literally a lifetime. That's how much BoCeoncept are prepared to stand by their products! That speaks volumes to me about the quality of the pieces and the fact they do have that free interior design service I already mentioned means that, if you take advantage of it, the pieces will be displayed in the best potential way - if redecorating doesn't give you the thrill it does me then hand it over to the professionals - for free. See you at your local store - which for me is the Glasgow branch (obviously!) but you can find your local store here.